Portable car garages are an easy and convenient way to protect your vehicles or belongings from the elements. They’re also multi-use, and you can use them as a storage shed or for parties as well. It’s also a very cost-effective option to invest in because the best portable car garage can cost a fraction of what you’d pay for a traditional garage. Before you buy a portable car garage, it’s important that you look around and compare several options, so you know that you’re getting the best option to suit your needs. We did the research for you and pulled 10 of the best portable car garage options available. 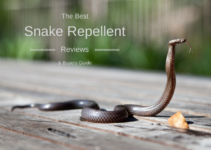 Our reviews will allow you to compare them side by side, and our buying guide will give you a good idea of important considerations to watch for with your new portable garage. One of the first things you have to decide is how many vehicles or items you need your portable garage to protect. You also need to include room to maneuver your vehicles or items under your portable garage. It’s a good idea to measure everything and get a base size so you can narrow your search down right from the start. This will vary depending on the size of the items you want to protect, and if they include any extras like trailers. You’ll want a rough estimate of how tall and how wide your vehicles are. A lot of the portable garages have height restrictions, so if you have a raised or larger vehicle, you may have trouble getting them into the garage. Ideally, you want to measure your vehicle or vehicles and add a few feet around it. This will ensure that you have room to get in and out and do things like open the trunk or tailgate. These types of garages are lightweight but strong, and the most common frame material is steel. It has superior durability over a lot of the other metals. You want to find a portable garage that has larger diameter steel framework. The thicker it is, the more it’s going to be able to stand up to wear and tear or pressure. However, steel is also a more expensive option, so you have to keep this in mind. The cloth covering on your portable garage is typically made from polyester or polyethylene. Polyester is usually the cheaper option, but polyethylene is the more popular choice. This is because polyethylene does a much better job of standing up to the elements, and it filters out more damaging UV rays that the lighter weight polyester does. There are portable garages that just have a roof, and then there are portable garages that are fully enclosed. Whether or not you need walls is entirely up to you, but they will offer your vehicle more protection. Some even come with windows to let natural light in, and some are detachable as well. 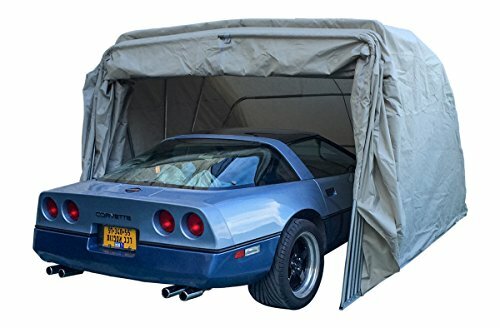 This portable car garage comes with a durable polyethylene top that is resistant to water and it is heat-sealed. The garage comes with a heavy-duty steel frame for added durability, and it has thicker tubing for increased stability. You’ll get very clear instructions with this portable garage, and it is designed to be very user-friendly and easy to put together. The sloped room ensures that water or snow will slide off and not collect to weigh it down. The framework is also powder coated to protect it from peeling and rust. This portable garage comes with heavy-duty steel framework that is both rust and corrosion resistant. 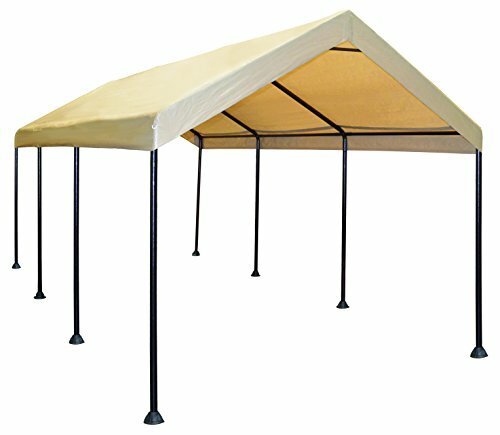 The polyethylene cover is designed to handle heavy loads of snow, rain, and debris for a safe and effective shelter. 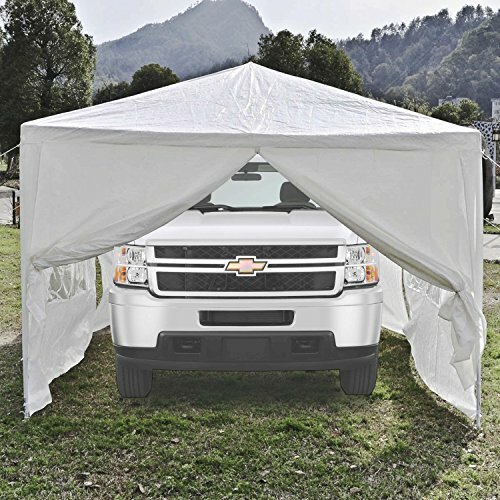 The cover attaches with heavy-duty bungee cords for added durability and stability. You get detachable walls so you can choose to have an open-air garage or a fully enclosed one depending on the weather conditions. The canopy legs all come with foot pads for added stability, and it comes with several anchors so you can secure it easily. This 20 by 10 foot portable garage is easy to set up and tear down. It comes with ropes, connectors, stakes, and an easy-to-follow instruction sheet. You can remove the back and front door for cross ventilation, and the walls come with built-in plastic windows. You get flexible and strong PE fabric that is supported by heavy-duty steel poles. The poles are anti-corrosion, and they’re also resistant to mildew and mold. This portable garage is designed to be easy to fold when you tear it down. 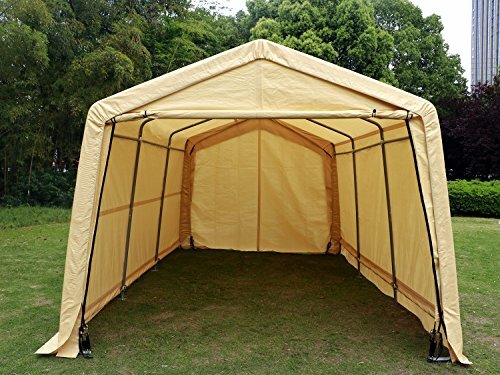 The flat round sockets ensure that this tent sits securely on the ground. You can get two different size garages with this setup, and they come in either a 10 by 10 by 8 or a 10 by 15 by 8 foot size. The material is a coated polyethylene, and the coating makes it UV-resistant, water-resistant, and fade proof. The steel supports are also coated to increase their durability, and the coating protects them from rust, corrosion, and peeling. The slightly pitched roof means that water and snow can slide off instead of building up, and this is better for the structure as a whole. The garage comes with a completely steel frame that has a thermoset premium powder-coated finish that extends the life the frame and makes it less resistant to wear. The stabilizers ensure that you get a durable and secure structure as well. It comes with a polyethylene cover that has triple-layer technology. 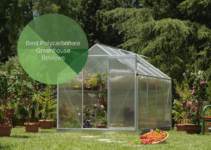 It also is designed to be resistant to mold, fungus, mildew, rain, and UV damage for a longer lasting product. You get a Ratchet-Tite cover tensioning system for a tight fit combined with an easy cross slide rail system, so your garage stays in place as long as you need it to. 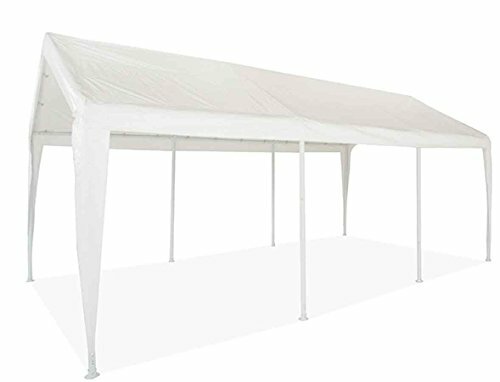 This heavy-duty portable garage comes with 600-D Oxford fabric that has a PU coating for added durability. It is designed to protect your vehicle from rain, snow, dust, frost, UV damage, and hail. It is a heavier option, and it weighs in at 170 pounds. You get a fast and easy installation process, and the steel supports lock into a steel plate that your car rests on. 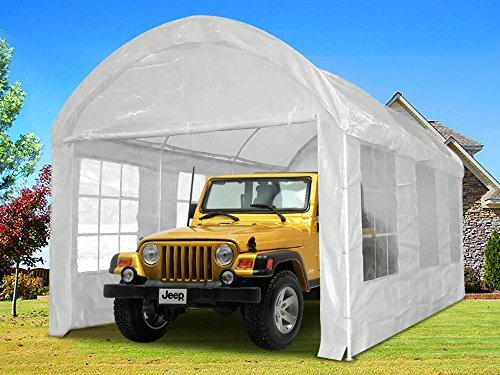 It is designed to provide all over protection, and you fold it over your car. It features a more compact design, so you do have to check your vehicle’s dimensions. 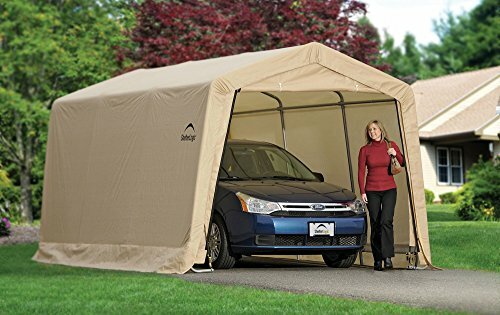 This portable garage comes in sand or grey, and you can pick from two different sizes. The covering is made out of advanced triple-layer Ripstop polyethylene that has a PU coating to make it more durable and resistant to water and UV damage. You’ll get a high-quality tensioning system that lets you get a tight fit for the cover, and this makes it less prone to tears or rips due to heavy snow. It weighs in at just under 80 pounds, and the steel framework is also coated to prevent corrosion or rust. This simple portable garage is nine feet high from the ground to the roof’s peak and 10 feet wide. It has six support legs that run the length of the structure, and they’re made out of steel that has white powder coating. 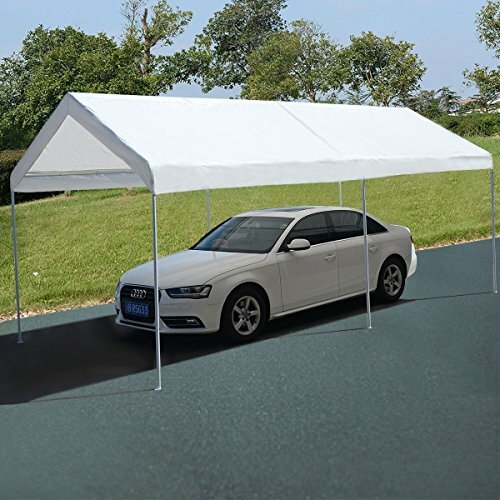 This garage offers 50 and up UV protection, and the support legs have flat plastic bottoms that help to ensure that it sits securely on the ground. You also get canopy stakes to help anchor this garage to the ground, and it features a very user-friendly design. Choose from a 10 by 20 or a 10 by 27 foot design. This garage has a height of just under 10 feet from the ground to the peak, and it is 10 feet wide. It comes with eight steel leg supports that sit along the length of the garage. The legs have foot pads attached for a sturdier end product, and you get a one-year warranty on the canopy, two years on the frame, and three years on the anchors. The cover is both UV and water-resistant, and the canopy anchors to the bottom of the leg supports. 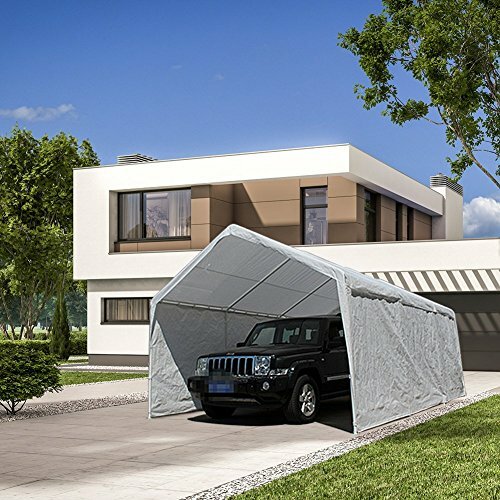 This portable garage comes with reinforced polyethylene roof and wall material that is resistant to water damage, rot, and UV damage. The roof and walls are supported by a heavy-duty powder coated steel frame, and the coating helps to extend the framework’s life. The front door and the back door are detachable so you can get good cross ventilation on hotter days. It also comes with three windows on each side so natural light can come through. The frame is held together by steel connectors, and it has a rounded roof. The best portable car garage can be a good investment whether you intend to use it to protect your vehicle or as an alternative storage option. There are several high-quality options to pick from, and each one offers benefits and drawbacks. It pays to do your research and choose the one that is going to do everything you need it to at a price that fits into your budget.